Have you ever thought about the complexity of the human hand? As quilters our hands are our most important tool, and it is vital we maintain good hand health. But more often that not, we don’t think about taking care of them until something goes wrong! It is so important that we regularly nurture our hands in order to strengthen our fingers and our wrists, and help prevent any unnecessary pain or potential damage. If you already have concerns about your hands, then it is a good idea to check with your doctor in case you have an injury or a condition causing you to experience pain or weakness. I am not a medical doctor and this information is not intended to replace medical advice. Being an arthritis sufferer, hand health is something I have become necessarily acquainted with! Unfortunately an injury in the hand or wrist can be debilitating (whether you suffer from arthritis, or not), and often recovery is a long term prospect! The older I get, the more I appreciate how vital it is to be proactive and maintain healthy hands if I want to continue crafting and creating things that are handmade! Keeping my hands warm and stretching them regularly are two things I am very conscious of, and in some ways they go hand in hand (no pun intended!) Before I start any form of crafting I make sure my hands are warm. Sometimes I find the simplest way to increase their warmth is to hold them under warm running water for a while; then when they are sufficiently warm I try to increase the blood flow to them by completing some basic stretching exercises. When stretching, don’t forget that your shoulders, neck, chest and back, as well as your arms and forearms all play a part in maintaining your hands. There are many YouTube videos you can find online that will guide you through some basic stretching exercises for your hands and wrists. If you are after something quick (and you don’t mind ‘quirky’) then you might enjoy this series of movements from Yoga with Adriene – all you need is a few minutes, and you will feel the difference in your hands (and no yoga experience is necessary – you can easily do the stretches standing up or sitting in a chair). Another way I keep my hands warm is with the use of compression gloves that increase my circulation. 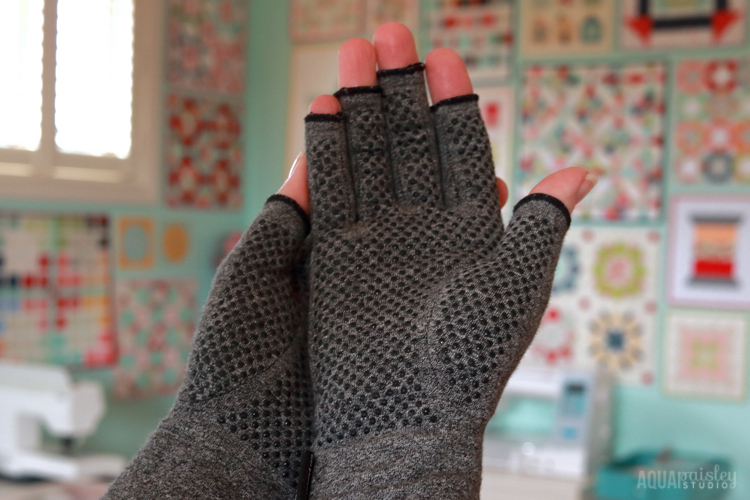 I will wear them when my hands are struggling to maintain any warmth, but I also use them as a way to ‘massage’ my hands after I have been crafting for longer periods of time, and especially after I have been stitching by hand. They don’t make the best fashion statement, but they are a great recovery tool to use when creating. Our bodies are not built to withstand repetitive motion, and assembly line sewing can result in exactly that! 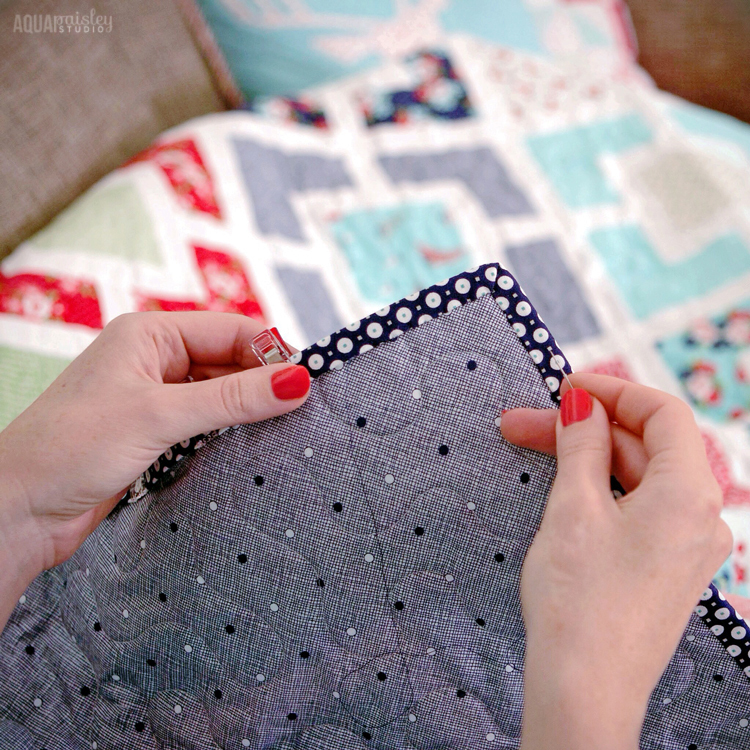 As a community, quilters have embraced chain piecing and techniques that help us sew faster and move on to that next thing on our never ending ‘to-make’ list – but while these techniques are great for productivity they can unintentionally become quite sinister for our body if we aren’t paying it the attention it requires. Spending too much time on our computers, phones or alternate devices can also cause RSI, and this may affect your ability to craft with your hands too! It is important when creating, to go back and forth between different techniques in order to give your hands a break. Depending on your hand strength, it might be a good idea to cut, piece and make a single block before you move on to the next, rather than batching techniques in the name of efficiency. Varying the motions your body is engaged in can help avoid any repetitive stress. Vary the muscles and joints you are using to create strength, rather than injury. 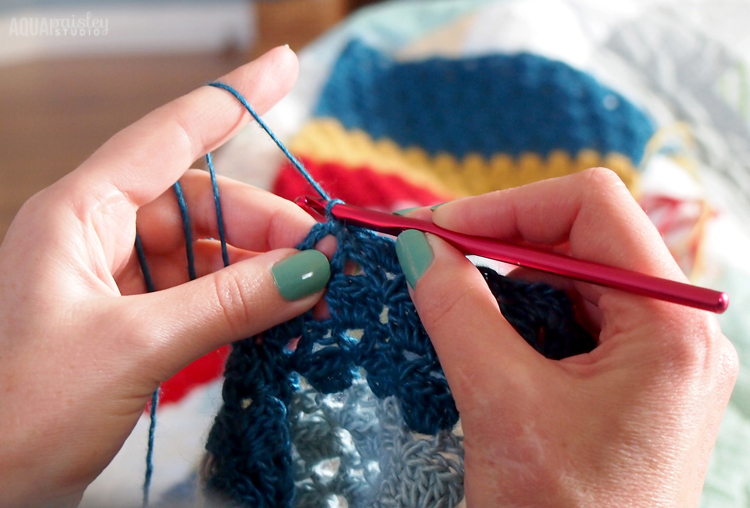 Even though I mostly use my hands to quilt, I will occasionally use crochet as a form of exercise to strengthen and work different muscle groups – but I never spend long periods of time with a hook in my hand, because by its nature, crochet is a repetitive motion. It is important to find the balance that works for you! As much as I hate to admit it, crafting in moderation is important. We are all probably too aware of how painful parts of our body feel after we have been enjoying long moments of creative flow, or if we are suddenly pushing ourselves to meet a deadline (even a self-imposed one) that works against our body’s natural rhythm. This sudden change in workload and increased pressure sets us up for injury, sprains and strains. Give yourself a break at least once an hour, stretch, and if you are feeling tired then call it a day! When I am hand stitching a binding I know that it will be a task that I complete over a number of days. I only ever stitch an area about the length of my arm before I give myself a break. Sometimes I only need a 10 minute break and I will stitch another length, but some days I will let my hands rest overnight and stitch again the next day – because for me, the micro movements required for the tiny stitches can be quite taxing on my right hand and wrist. Listen to your body, and do what works for you! 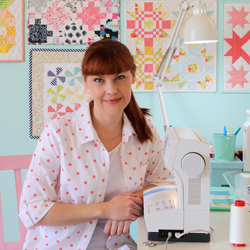 Be aware that there are many tools for quilters that can aid with ergonomic comfort when quilting, and invest in the ones that provide the most benefit to you. The two things I believe are essential for everyone are a quality ruler with a non-slip back, and a sharp rotary cutter. Both these items are in every quilter’s toolbox, and are used on a regular basis; and both can reduce the stress placed on your hands and wrists if you choose them wisely! I have already said this, but it warrants its own paragraph! All of these tips require you to listen to your body and act accordingly, the moment you feel any tension or pain in your body you should stop and try to evaluate where it is coming from and what the possible cause might be. We all have individual strengths and weaknesses that can affect our crafting abilities differently. There are a number of simple things you can do to try and maintain healthy, supple and agile hands. Use gloves when dealing with any situation which might cause callouses (such as gardening) or strip your skin of its natural oils (such as cleaning or washing the dishes). Treat yourself to a regular manicure, even if it’s only one you give yourself. Keeping your nails and cuticles in good condition will help to avoid unnecessary pain or discomfort in your fingertips. Use moisturizer regularly. Some of my favourite products are in the image below. I use the Nivea throughout the day – it’s cost effective and doesn’t leave a greasy residue on anything I am handling. The Crabtree & Evelyn products are more costly but they are luxury in a tube! 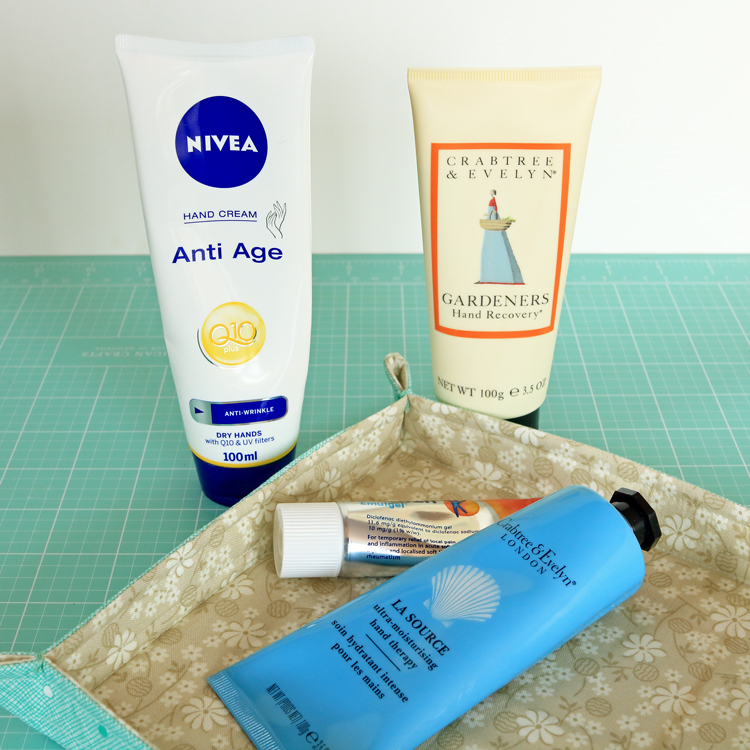 The Hand Recovery is more like a scrub, and I only use it once or twice a week, and the Ultra Moisturising Hand Therapy is a great intensive burst of moisture perfect for when I have finished crafting for the day. I also keep some anti-inflammatory gel in the studio for when my hands begin to ache. It’s hard to admit that an activity that brings so much joy could possibly also be the cause of much pain, but if we neglect to take care of our hands then it is a possibility! 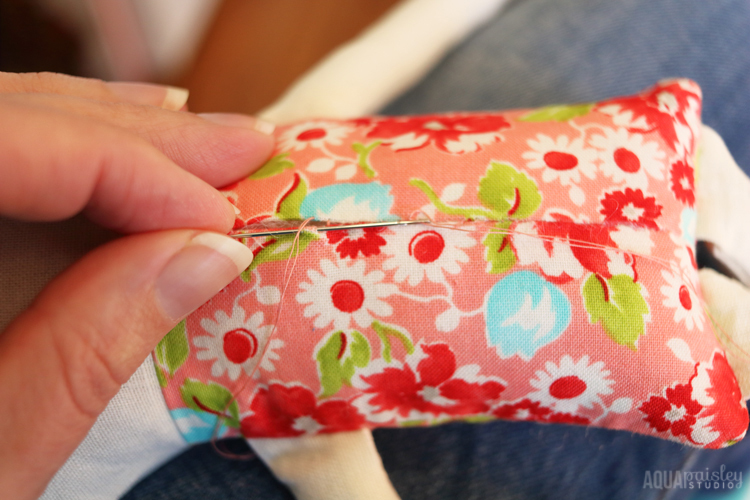 Remember an injured hand can become re-injured much more easily, and then you may be sidelined from quilting for longer than may have originally been necessary. Don’t wait until you are experiencing pain to start to take care your hands – be proactive and START NOW so you don’t have to experience it!! If you have some tips or experience with hand health, I would love to hear from you! You know, I’ve never paid much attention to my hands, but I can see that I really should! I have had a sore shoulder once, which I’m pretty sure was due to excess photoshopping (mouse moving and clicking) when I was editing my photo backlog a few years ago. I had to step back from the computer and sewing while it got better. I found that pushups were really good for shoulder strength so I do them almost every day. I’m lucky being up here in Qld – the hands never get as cold as they used to when we lived in Canberra…brrrr. I’m guilty of sewing too long and taking too long to replace my rotary blade. I will definitely try to be better in the future! Computer work is without a doubt one of the reasons my body feels stressed! It is surprising how much upper body strength you need to be able to quilt regularly, and push ups are a great idea – definitely something I should work on! I am envious of your warm weather, but not such a big fan of the humidity that goes along with it (since I have crazy hair on a good day) – LOL! Great advice, Samantha. While I don’t have as much problem with my hands, I do have lower back issues and your encouragement to take breaks and not marathon sew are things I need to do for my back. It’s better to slow down and enjoy the process by choice rather than have our bodies get injured and make that choice for us. Everything is definitely connected – for some people they need to be aware of their back, others their shoulders, and others their hands, but everything can effect the others if we aren’t careful. I am really appreciative of those makers who are encouraging us as a community to slow down and be more mindful about the things we make – I think it makes for healthier bodies and minds. I hope you are able to find some relief soon Corinna! Thanks for the great information. I need to look into compression gloves. I frequently use knitted fingerless gloves when doing hand work. I find them a really useful recovery tool Jen, but I don’t like to wear them when I am actually busy creating with my hands. They definitely encourage circulation though, which is quite therapeutic when relaxing after a long day of use. This is a wonderfully informative post! I’ll share it with my quilling (2 lls) friends, as we also run the risk of repetitive stress injuries. thanks for dropping by my blog and leaving a comment – I appreciate it! It took me a second to work out the 2lls – but then I had a nice laugh. Great post! Ergonomic body position for me always brings to mind dropping my shoulders (I tend to hunch my shoulders up around my ears when using the narrow keyboard on my ipad cover) and sitting up straight and not letting my chin just forward (again ipad use causes me to slouch forward). I love handwork and gardening, both of which require hand strength and can often causes sore hands. Thanks for sharing what products you use to care for your hands. I find a little pampering before turning out the lights at night makes for happy hands!